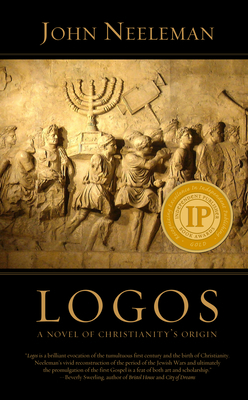 Logos is a bildungsroman about the anonymous author of the original Gospel, set amid the kaleidoscopic mingling of ancient cultures. In A.D. 66, Jacob is one of Jerusalem's privileged Greco-Roman Jews. When Roman soldiers murder his parents and his beloved sister disappears in a pogrom led by the Roman procurator, he joins Israel's rebellion against Rome. The rebellion he helps to foment leads to more tragedy-personal and, ultimately, cosmic: Jacob's wife and son perish in Rome's siege of Jerusalem, and the Romans destroy Jerusalem and the Temple, and finally extinguish Israel at Masada. Jacob wanders, and in Rome, he joins other dissidents-plotting vengeance not by arms, but by the power of an idea. Paul of Tarsus, Josephus, the keepers of the Dead Sea Scrolls, and the historical Jesus himself each play a role in Jacob's tumultuous fortunes, but the women who have loved him compel the transforming and subversive climax. John Neeleman spends his days working as a trial lawyer in tall buildings in downtown Seattle. He lives in Seattle with his wife and children. He also represents death row inmates pro bono in Louisiana and Texas. As a novelist, his editorial model is historical fiction in a largely realistic mode, though there are hallucinatory passages that reflect Neeleman’s concern with philosophical and spiritual matters, in part a residue of his religious upbringing. He was raised as a seventh generation Mormon, and rebelled, but never outgrew his interest in metaphysical concerns.